The 442 Class, or “Jumbos” as they are often known, are an excellent example of how former Government owned locomotives that were withdrawn and set aside have found a new lease of life in the brave new world of private rail operators. Many of the surviving class members have seen their fair share of operators come and go, and yet they have survived them all, and the majority will continue to do so for the foreseeable future. The 40-strong 442 Class was introduced as a replacement for the NSW Government Railways fleet of 40 Class locomotives. The 40 Class had originally entered service in 1951, an almost off the shelf American Locomotive Co. (ALCo) design, modified for NSW conditions and loading gauge. By the late 1960s, the 40 Class were beginning to become unreliable and a rebuild of the class to keep them in service would be uneconomical. The concept of trading-in older locomotives to offset the cost of new locomotives was proving to be a popular concept in the United States of America, leading to the New South Wales Government Railways (NSWGR) signing a tender with A. E. Goodwin Ltd to accept the 40 Class units as trade-ins on twenty new main line diesels. This concept would prove to be too ambitious, with only limited parts (traction motors, compressors, auxiliary generator, eddy current clutch and power take-off) being re-used. Whilst the initial order of twenty was being built, a further twenty were ordered to ensure the entire state could be dieselised, pushing out the last strongholds of steam in NSW. In an unusual move, 4001 was present at the official handover of 44201 from A.E. Goodwin to the NSWGR, standing nose-to-nose with the new arrival at the ceremony on 21st October 1970. 4001 would survive the trade-in period, and is preserved by the New South Wales Rail Transport Museum. A potential threat to the final six units was the closure of A. E. Goodwin in 1972 (following a takeover by A.G. Healing Limited). Commonwealth Engineering would renegotiate to become the Australian licensee of ALCo/MLW products, completing 44235-44240 at their Granville plant. These final six 442 Class would vary from the earlier models, delivered instead with Mitsubishi AC alternators, rather than auxiliary generators. After introduction and trials, the 442 Class settled into government service with ease, proving popular with loco crews (aside from initial concerns about rough riding, which was corrected as the class were trialled and accepted). The class were seen on various lines around the state, although initially not the Western Division or south of Bombo. However, the class would gradually find itself gravitating to the Northern Division, working to the North Coast and North West regions of the state more and more frequently. The last years of the class in government service would be spent working intermodal trains to Brisbane, as well as the grain and coal traffic between the Werris Creek/Gunnedah region and Newcastle. The delivery of the 81 Class locomotives in 1982 would see the 442 Class’ role as interstate motive power greatly diminished, as well as their position on coal and grain traffic to the Gunnedah Basin threatened. The delivery of the 82 and 90 classes in 1994 (totalling 58 and 31 units respectively) would seal their fate. The first nineteen of the class would be withdrawn in 1994, sold at auction to various private operators. More of the class would be withdrawn and sold over the next few years, with the final two operational units (44211 and 44212) withdrawn in March 1998. 44211 was identified as the official candidate for preservation, forwarded to the NSW Rail Transport Museum, at Thirlmere. 44211 would later be repainted from FreightCorp Blue to the original Indian Red scheme it entered service in, with the locomotive still used on Heritage Express trains today. Silverton Rail initially purchased four surplus 442 Class at auction in 1994. All four units were renumbered into the “442s” series, to assist in distinguishing them from those units still in government service – 442s1 (44220), 442s2 (44217), 442s3 (44203) and 442s4 (44202). No sooner were they renumbered, they were then leased to National Rail for use as bank engines whilst the NR Class was being delivered. All four of the class would be de-hired by 1996. 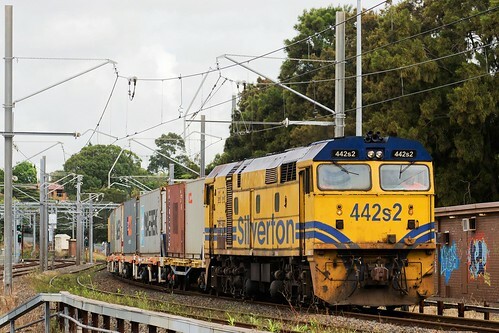 Silverton Rail would acquire a further pair of 442 Class from Morrison-Knudsen Australia (see below), to form 442s5 (44223) and 442s6 (44226). All six of the class would later find work in NSW on various Silverton workings. Silverton Rail purchased a final two 442 Class at auction in January 1998, acquiring 44235 and 44237 as parts donors for their other locomotives. Never to re-enter service, the two locomotives were stripped of useful parts and scrapped at Chullora. Silverton Rail would repaint their new 442s Class into one of two schemes. The original four would be repainted into the blue/yellow scheme with large Silverton logos along the side of the locomotive (originally introduced in 1984), and cab-front numbers. 442s5 and 442s6 were painted into a more modern version of the blue/yellow livery, with stylised Silverton logo on the nose and sides. When Silverton Rail was sold to Western Australian company South Spur Rail Services (to form Southern & Silverton Railway) in 2006, the companies locomotives were sold to Allco Finance Group to be leased back to the new operator. 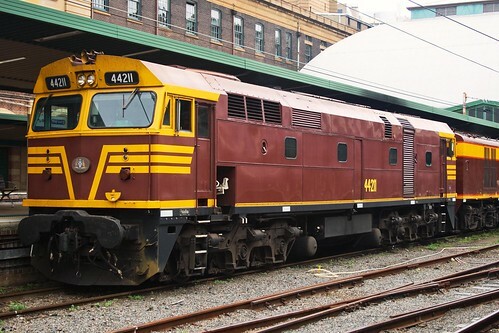 The 442s Class would continue in service with their “new” operator and owner on various services within NSW, including regional containerised grain and ore services, as well as general freight and trip trains within the Sydney metropolitan area. When Allco Finance collapsed in 2008, the six locomotives were sold to a Coote Industrial controlled company, Greentrains. Greentrains would acquire the majority of the former Allco lease fleet, with the intention of entering the lucrative locomotive lease market (enjoyed almost unchallenged at this point) pioneered by CFCL Australia. Shortly after the sale, Coote Industrial painted three of the class (442s1, 442s2 and 442s5) in a new corporate scheme of all-over green, with yellow cab fronts, with the repainted units continuing to see use on Southern & Silverton trains around NSW, as well as Victoria and South Australia. When South Spur Rail Services was sold to P&O Trans Australia in 2010, part of the (revised) conditions of sale included the addition of motive power refurbished by another Coote subsidiary — Gemco. 442s4 would be the only 442 Class transferred as part of the sale, renumbered back to 44202 and emerging in a the livery of Qube Logstics, the controlling company of P&O Trans Australia. 442s3 was set aside during 2011 at the Gemco facility in the former Parkes Locomotive Depot. Stripped for parts and nothing more than a shell, the locomotive was put up for sale for scrap during late 2012, along with a selection of other unviable Greentrains assets. 442s6 was also not repainted into the Coote Industrial/Greentrains scheme, although it has fared better than sister 442s3. The Silverton logos have been painted over during overhaul, although otherwise it remains more-or-less in the Silverton scheme it was painted in when first renumbered. It remains part of Greentrains operational lease fleet. 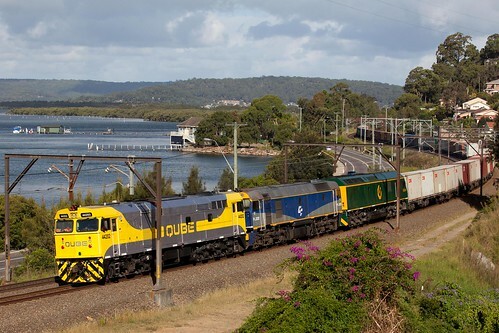 The remaining four members of the class remain in lease service with Greentrains (now controlled by Engenco Limited), leased to companies including Qube Logistics (having taken over P&O Trans Australia completely during 2011), El Zorro and Sydney Rail Services. The class can often be seen on anything from export grain to container trip freights and ballast train work! Of the nineteen units auctioned in December 1994, Morrison-Knudsen Australia (MKA) acquired twelve for a planned rebuild at their Whyalla (SA) plant. Aside from the two units later on-sold to Silverton Rail (see above), the rest were stripped down to their components for rebuilding with EMD 16-645F engines. The first candidate would be 44227, having the frame lengthened by 1.5 metres before work was stopped after MKA’s parent company (Morrison Knudsen Corporation) ran into financial difficulties. Eventually the project would come to fruition as the RL Class, albeit with most of the original 442 Class parts discarded from the final design — only the bogies and some of the traction motors were retained for use under some of the new locomotives. It is understood that the remaining, unused 442 Class parts were sold and/or scrapped. Austrac (based in Junee) purchased 44229 and 44233 at the 1994 auction (renumbering them as 101 and 102 respectively) and sent them to Junee Railway Workshops for overhaul for lease service to BHP. The units were painted into the BHP colour scheme, and dispatched to Port Kembla for use on heavy coal traffic to the steelworks, on long-term lease. The two units would operate out of Port Kembla until 2001. 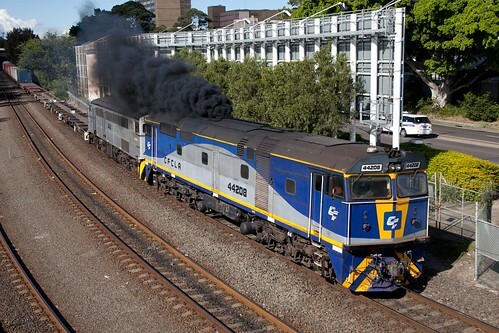 101 and 102 would pass into the ownership of CFCL Australia, and would find themselves included in the 442 — GL Class rebuilt program by United-Goninan’s at their Broadmeadow facility. 44229/101 would become GL109, whilst 44233/102 became GL107. Delivered in 2001, Great Northern Rail Services purchased fourteen 442 Class locomotives from Freightcorp (shortly before the sale of FreightCorp to Toll/Patrick). 44232 would be overhauled and returned to (lease) service as JL406 by the end of 2001. JL401 (44204), JL402 (44206), JL403 (44208) and JL404 (44209) would eventually return to service under CFCL Australia (the new owners of the Great Northern Fleet after the company collapsed in 2002). A sixth JL Class (JL405/44212) never eventuated, with CFCL Australia instead rebuilding twelve 442 Class (including JL406) to become GL Class. CFCL Australia GL Class locomotive. Four of the JL Class would remain in their original 442 Class forms, eventually being renumbered back to their 442 Class numbers. The four ex-JL Class would see lease service with a variety of operators, including Freight Australia, Lachlan Valley Rail Freight (LVRF)/Independent Railways of Australia (IRA), Patrick PortLink (defunct), El Zorro, P&O Trans Australia/Qube Logistics and Southern Shorthaul Railroad. JL403 and JL406 were the only JL class locos to wear the CFCLA colour scheme, whilst 44209 was painted into the latest version of the CFCLA scheme in 2012 (having previously worn the R&H Transport scheme). At the time of writing, both 44208 and 44209 are leased to Qube Logistics. 44204 and 44206 would be sold in 2012, this time to Southern Shorthaul Railroad following an extended period of lease. The two locomotives had initially seen work on infrastructure traffic with the majority of the SSR fleet, although they were often used on Centennial Coal traffic following SSR winning a contract to move coal from Newstan to Port Kembla/Newcastle in 2010. It is understood that SSR plan to repaint the two units from their current schemes into the SSR livery. 44204 wears a blue and yellow scheme similar in design to the original NSWGR Indian Red scheme, whilst 44206 wears a similar livery, albeit with green instead of blue (shortly after re-entering service, and whilst classified as JL402, the unit was painted in the Freight Australia scheme). With the delivery of the CEY Class in 2012, the two SSR 442s have once again reverted back to infrastructure traffic. 44206 was painted into the SSR livery in mid-2013, with 44204 to follow in due course. Whilst the imminent scrapping of 442s3 (44203) might be seen as cause for concern, the remaining members of the class in service look set to continue in service for a few years to come yet. Whilst the appeal of the class as mainline units might wane as newer horsepower is delivered, they seem well suited to infrastructure and trip train duties. With the ever-increasing truck congestion at the ports, it would seem that these locomotives might find a niche retirement role with which to spend their remaining years. 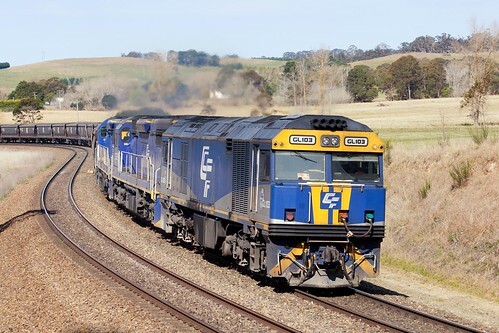 As CFCL Australia continue to divest themselves of their older, less powerful locomotives, it is hoped that the operators of metropolitan container trains might look to purchase them. The survival of the class is guaranteed with the operationally preserved 44211 at Thirlmere, regardless of the class’ future in mainline operation. 442s Class Database (on Railpage Australia). Thanks to Richard Whitford and Chris Walters.